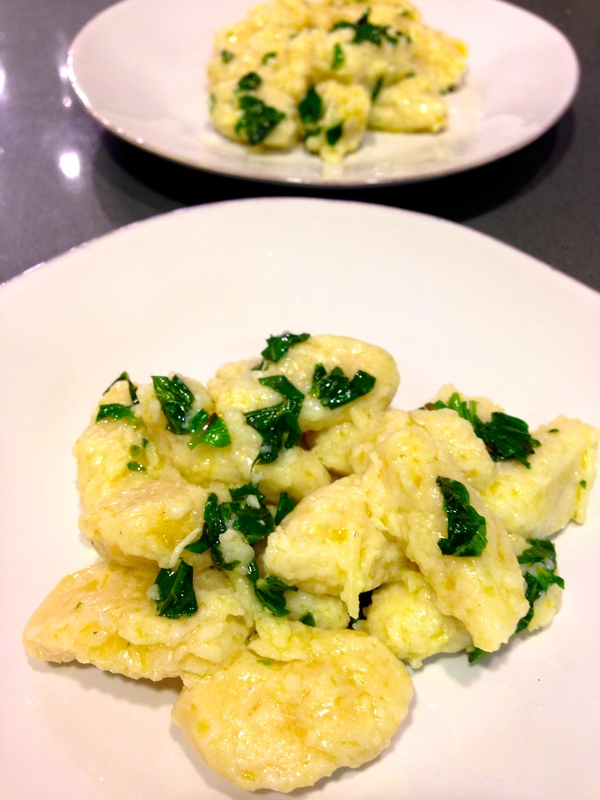 My husband loves gnocchi so I was happy to find this recipe for an easy version. These gnocchi are so light and fluffy, and doesn’t use your typical potato base for the dumplings. You will be in awe on how deliciously light this meal is! For the gnocchi: In a large bowl, combine the mascarpone, egg, egg yolk, nutmeg, lemon zest, Parmesan, and salt. Using a hand mixer, beat on medium speed until light and fluffy, about 1 minute. Gradually beat in 3/4 cup flour until the mixture forms a soft dough. Sprinkle a pie pan or rimmed baking sheet with flour. Using 2 small spoons, drop 1 teaspoon-sized pieces of dough into the pie pan. Shake the pan gently to cover the dough with flour. Gently roll the pieces of dough into oval shapes. Bring a large saucepan of salted water to a simmer. In batches, carefully add the gnocchi. The gnocchi should sink and then float to the top. As soon as the gnocchi begin to float, cook for 5 to 6 minutes. Drain and place in a large serving bowl. For the sauce: In a small saucepan, warm the oil and salt over medium-high heat for 1 1/2 minutes. Remove the pan from the heat and stir in the basil. Let the mixture sit for 5 minutes to allow the flavors to blend. Add the sauce, cheese, and lemon juice to the gnocchi and gently toss until coated.